Billions of euros of investment in upgrades to West African harbors by governments and companies will provide enough capacity for them to operate sufficiently for the next 10 years, Bloomberg writes today quoting Bollore Ports, the leading port operator in Africa. Countries in the region have been investing heavily in ports to cope with rising traffic and to accommodate larger cargo vessels as economic growth increases. Bollore’s biggest projects on the continent include the developments in Ivory Coast, Sierra Leone and Cameroon, as well as the expansion of the port of Tema in Ghana. Stanislas de Saint Louvent, deputy Chief Executive Officer of Bollore Ports, tells in an interview that this Ghana project, worth USD 1 bln, is well advanced” and should be completed by the middle of next year. Another one, a EUR 400 mln (USD 494 mln) investment by the company and its partner APM Terminals, with input from China Harbour Engineering Company Ltd., in a second container terminal in Abidjan, Ivory Coast’s commercial capital, will be operational by mid-2020. In Sierra Leone, Bollore is finalizing an extension to a container terminal in the capital Freetown, due to be finished in September. Those three projects will take up the majority of Bollore’s Africa investment in ports over the next three years, De Saint Louvent said. The company has spent almost EUR 3 bln in Africa over the past decade, including in railway and transportation as well as ports, Jerome Petit, Africa CEO for Bollore Logistics, said in the same interview. 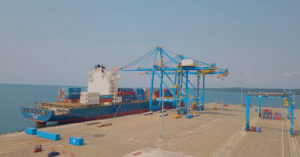 In Cameroon, Kribi Containers Terminal (KCT) became operational last month, handling its first commercial vessel on 2 March 2018. Kribi is Cameroon’s only deep-sea port, built by CHEC and mostly funded by the Eximbank of China, and is partly run by Bollore. Currently, the terminal provides a 350m quay with 16m draught, equipped with 2 STS and 18 hectares of storage area operated by 5 RTGs. The French company intends to invest further EUR 380 mln in KCT’s second phase in order to optimize the operational management and improve the productivity of the terminal. However, these projects may face competition on the part of the neighbouring Nigeria, which is about to call for expressions of interest in its new project of Ibom Deep Seaport on the southern coast, as we wrote earlier. And Ibom is not the only Nigerian project. Others in Lekki and Badagry driven by the Lagos State government and another one in the Cross River State have been announced. How they materialize remains to be seen, of course, but the intention to capture the increasing traffic is definitely there. Bollore holds concessions to operate container terminals in 15 countries in West and Central Africa, including Guinea, Togo and Nigeria. The company also runs 25 dry ports including in landlocked nations such as Burkina Faso and Chad. The group’s market share in Africa is about 13%.